No one knows where the term Underground Railroad came from--there were no trains or tracks, only "conductors" who helped escaping slaves to freedom. Including real stories about "passengers" on the "Railroad," this book chronicles slaves' close calls with bounty hunters, exhausting struggles on the road, and what they sacrificed for freedom. With 80 black-and-white illustrations throughout and a sixteen-page black-and-white photo insert, the Underground Railroad comes alive! 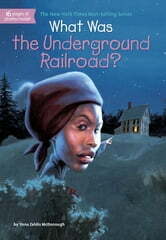 Books related to What Was the Underground Railroad?